Although the DFB Pokal offers a great platform, especially for underclass teams, to compete with the best teams in a country on a competitive level, the annoyance at both MSV Duisburg and SC Paderborn is likely to be rather small than the draw last year brought a direct duel for the quarter-finals. A second division will definitely make it into the round of the last eight. However, between Duisburg and Paderborn now to make a reliable prediction of who this will be, but it turns out to be difficult, because on the one hand knows the cup known his own laws, on the other hand there are numerous arguments that speak per MSV, but also per SCP. However, both clubs from the west of the republic have one thing in common: at the weekend they celebrated important successes in the league. 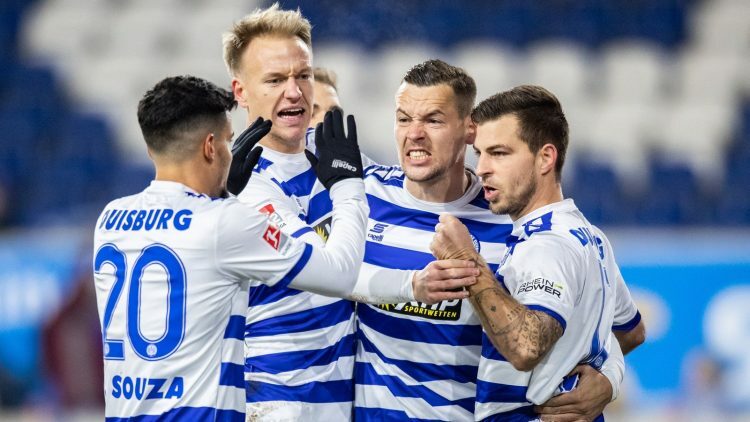 The zebras landed a real liberation in the table cellar in the 3: 2 against Darmstadt 98, while the former Erstligist from East Westphalia Fürth dismantled at home 6-0 and thus once again put the huge offensive qualities to the test. The self-confidence gained through this victory as well as the fact that the team of Steffen Baumgart due to the classification situation may approach something more unbiased, lead in the encounter Duisburg vs.. Paderborn to good odds tip on the fact that the guests realize the quarter-finals collection. Often, the rating “important” in terms of significant league games is used inflationary. The encounter of MSV Duisburg against SV Darmstadt 98 last Friday had the character of a groundbreaking match but absolutely earned. Because in the struggle for relegation, the direct competition from Sandhausen and Magdeburg victories entered, the zebras threatened in the event of another defeat against the lilies not only a raven-black match day, but also the overall sixth league defeat in a row. Fortunately – from the perspective of coach Torsten Lieberknecht – this worst-case scenario could be avoided. Against the Hessen were a strong start phase and two goals after 25 minutes to get security. The 3: 0 after just under an hour meant the presumed preliminary decision, although the two late goals once again signaled that the relegation candidate of sovereignty or even defensive stability is far away. In the end, however, counted for the zebras, the three points, with the kicker of the Wedau still hang on the penultimate place. Admittedly, the performance in the league has little in common with the prospects in the DFB Pokal and yet it would be wrong to look at both competitions in isolation. For example, should be noted on Tuesday in duel Duisburg against Paderborn in any prediction that the Lieberknecht Elf is still the worst home team of the lower house. In ten matches in front of their own fans, there were two wins and eight defeats. The nine goals scored and the 20 goals conceded that the blue and white striped in both categories are in front of home crowd in last place. A descent into the 3rd league would be a disaster for the further development of the former Bundesliga, which is why there is no need for two opinions, that the daily life of league enjoys the highest priority. So, although the actors take no opportunity to say that they want to get as far as possible in the cup, the question must be asked, whether subconsciously swimming with small doubts, the potential quarter-final in the German club as an additional burden, be it physically, but before all mental, attest. Although the aforementioned defeat series was stopped by the 3-2 win, yet the Meidericher SV always caught at least two goals in the recent six competitive matches. Due to the outstanding SCP offensive is exactly here, in the defensive vulnerability, make a weighty argument that justifies on Tuesday between Duisburg and Paderborn a tip on the progress of the East Westphalia. The victorious Elf from the Darmstadt game must be changed in any case in one position. Right-back Enis Hajri will fail due to a lacerated wound. Other changes are not excluded, especially since the weekend is the next “big-point” game in the kriselnden Fürthern on the program. Baffoe, Neumann, Tashchy and Gartner are also missing due to injury. The SC Paderborn has done it again! For the sixth time this season (!) Marked the East Westphalia at least four goals in a game. This year’s winner was SpVgg Greuther Fürth, who lost in the Benteler Arena with 0: 6. At half-time, the team led by Steffen Baumgart 3-0, but did not let up after the break and put three more hits. So anyone who believed that the 0: 2 during the week in Regensburg caused general insecurity at the sports club, was taught three days later, a better. The newcomer still plays an outstanding round and can be logically quite satisfied with seventh place. Even the faint hopes for a return to the House of Lords got new food at the weekend, because with currently three points behind third place and the best goal difference of all pursuers dreams should definitely be allowed. The fact that the Ostwestfalen – behind the 1. FC Köln – have the best goal difference of all second division, of course, they have primarily owed to the offensive. With 48 goals, the SCP is currently even the most dangerous attack of the second highest German league. Alone in the last three home games Sven Michel and Co. get 15 hits. However, Coach Baumgart’s side had some problems in the last race. Three of the past four away games in the second division were lost without their own goal, including the encounter in Duisburg (2: 0). To what the spectacular Paderborn but are able to afford, for example, at 5: 1 in Heidenheim visible. With a similar performance on Tuesday in Duisburg Paderborn would be in the lead for many predictions. When we philosophized on the zebra side about the mental component, so should be stated at the sports club, that the very comfortable starting position in the second division classification to a certain Unbefangen- or carefreeness. The East Westphalians do not feel pressure, which should have a positive effect on their performance. In addition, the Paderborn know what it’s like to move into the quarter-finals of the DFB Cup. With a similar formation, the Baumgart-Eleven marched in the previous year to the round of the last eight and failed there only at Bayern. The failures of Bruggemeier, Fesser and Shelton are quite easy to compensate. After the third competitive match the coach will go through a shot within seven days. The lower squad, especially in the offensive, is another point after the physical strain of last week, thanks to the lower quotas between Duisburg and Paderborn to understand the guests. The MSV likes to play against the SCP. Eleven victories in 19 matches underpin this impressively. Interestingly, however, the Ostwestfalen had retained the upper hand in both previous DFB Cup duels. In 2004/2005 Paderborn prevailed at home in the second round 2-1; 2013/2014 won the sports club even on the Wedau. In general, the former Bundesliga team has three out of four successes in Duisburg. A good omen for Tuesday? By the way, the zebras prevailed in the league with 2: 0, although Paderborn made twice as many shots on the goal and finally failed only at their own chance exploitation. The only eighth-final duel between two second division teams will be held on Tuesday evening by Duisburg and Paderborn. The odds imply a favorite role of the guests, for whom we understand due to the previous impressions this season. The SCP has the best offense in the league (48 goals) and won 6-0 against Fürth at the weekend. In the classification, the climber has almost twice as many points as the MSV and therefore ranked with hopes for the return to the House of Lords in seventh place, while the zebras have to fear for relegation. The relegation battle in the league enjoys top priority, so that in view of the upcoming task of Duisburg a rotation should not be completely ruled out. Duisburg won only two of the ten home games (including against Paderborn) and has both the weakest defensive and the worst attack in front of home crowd. Although the East Westphalians are far from as strong as they are at home, we are fully convinced that in the match between Duisburg and Paderborn a tip for the advancement of the Baumgart-Elf can be expected. To satisfy their own fans, the white and blue stripes inevitably have to risk something. The SCP can lurk and rely on the tremendously fast transfer players. In the Duisburg vs. Germany. Paderborn odds for a win after regular time is also to recognize Value, but we have opted for the “To Qualify recommendation”, choose the use with seven units deliberately high.